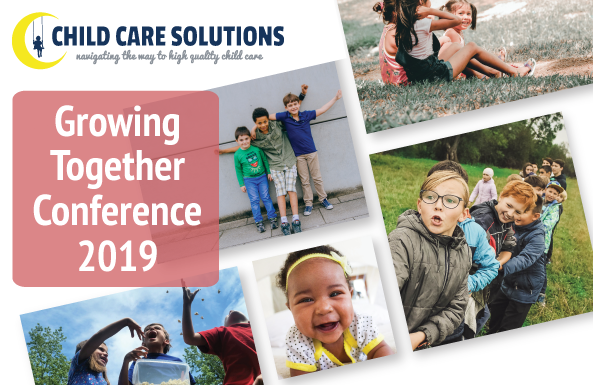 Join Child Care Solutions on Sunday, March 31st, 2019 for our annual spring training event, the Growing Together Conference! Featuring workshops that cover a range of topics including addressing biting in your program, using the OCFS incident report form, daily health checks and more, this year's conference has something for everyone! You'll find complete workshop descriptions below. Conference participants will earn up to 4.5 OCFS training hours attending three workshops and enjoy a networking lunch and door prize raffle. We recommend registering by March 22nd for best workshop selection. Online registration for the conference is available by clicking here. You may also print and mail completed registration form with payment to 6724 Thompson Road, Syracuse, NY 13211; download the registration form here. If you have any questions regarding the conference or would like to register over the phone, please give us a call at (315) 446-1220. See you on March 31st! The Growing Together Conference will be held at Cayuga Community College located at 197 Franklin Street in Auburn, inside the Main Building. 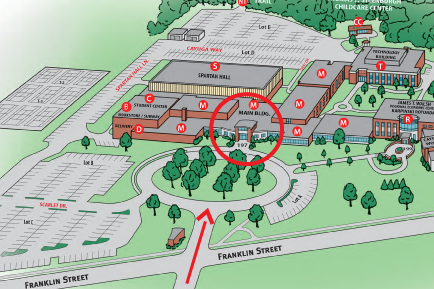 Enter the CCC campus from Franklin Street; the parking lots will be on your left. Use the entrance indicated on the map below. Financial assistance to attend CCS’ conferences and training workshops is available! Many providers qualify for either the CSEA/Voice Professional Development Program or EIP (Educational Incentive Program). Learn more about these programs here! This training will discuss different elements of biting in child care programs as well as strategies for children who bite and how to appropriately work with families when these situations arise. This training reviews the importance of the Daily Health Check as part of the daily drop-off process. Participants will learn, based on OCFS regulations and recommendations, how to properly conduct, document, and interpret results of the daily health check. Kids love playing with cardboard boxes, sometimes more than the fancy toys that come in the box. In this session, participants will learn about the educational opportunities when they bring cardboard boxes into the classroom. Ideas will be presented on ways that cardboard boxes can be used in the classroom as well as the value of letting children use their imagination and creativity to decide how they want to use the materials. Incorporating STEM with infants and toddlers is an important factor in learning and development. This training will discuss the importance of STEM as well as ways to implement STEM into your infant and toddler programs. This training will focus on the proper documentation using the OCFS Incident Report form. Participants will review OCFS requirements for supervision, and discuss the role supervision plays in minimizing injuries, as well as other preventative measures that can be taken. In addition, discussion will take place for how to offer low-risk active play for children and still address safety needs.